Difficulty Notes: No real difficulties for seasoned scramblers. Beginners could find some sections a bit exposed or loose. 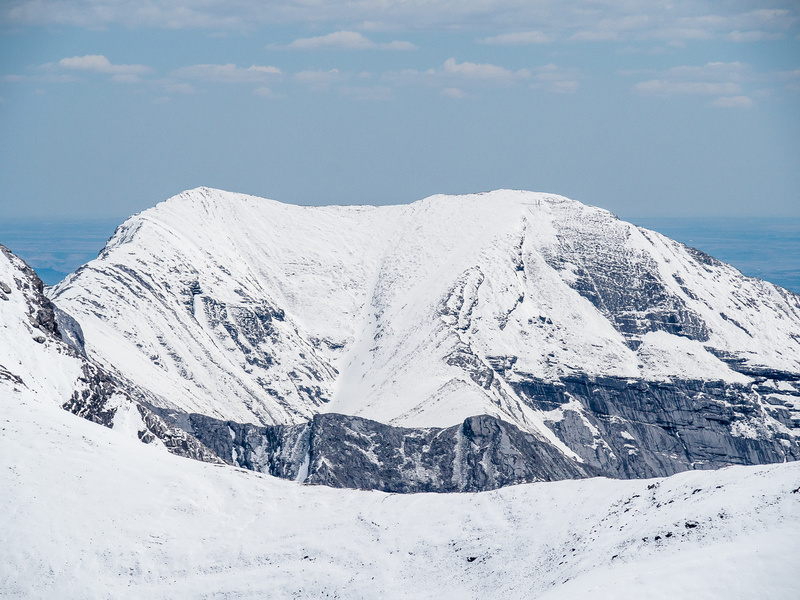 Very different with snow – avalanche terrain and exposure. On Saturday, May 12 2018, Wietse and I managed to summit a peak that’s been on my to-do list for quite a few years now. Over the years, since Bob Spirko first published an easy scrambling route to its summit, Cougar Peak (in the Fairholme Range rather than in the North Highwood) has slowly become a surprisingly popular Spring objective for people like me, eager to bag something more than a front range bump when many other deeper range peaks are still plastered in a mushy white coat of unpredictability. 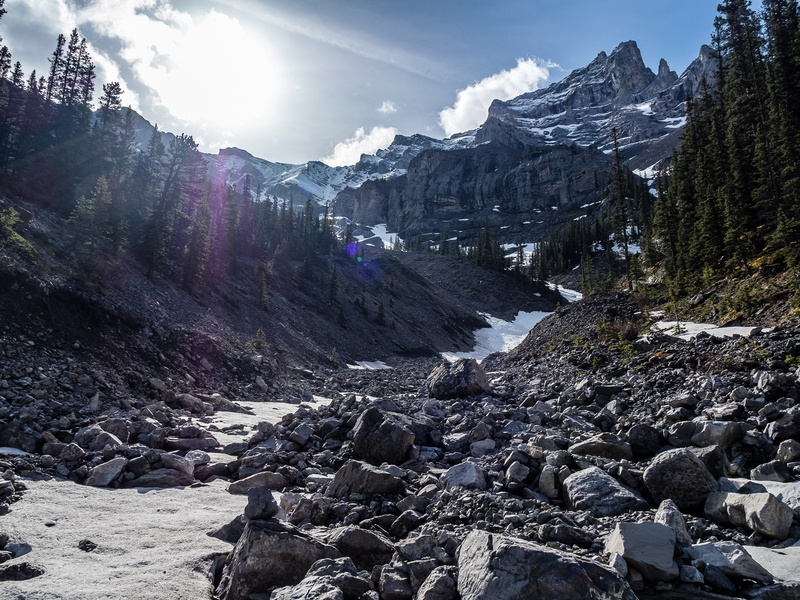 We started our day from the parking lot in Canmore, under a very clear and very cool morning at around 08:00. Wietse had been up Cougar Creek all the way to Townsend Mountain and knew what we were in for. I haven’t been in the area for many years and obviously it’s changed a lot since then – especially since the 2013 floods. At the car we decided to pack crampons and axes thanks to an outlier of Townsend we could see that looked plastered in fresh snow. The creek was generally very quick and easy travel compared to a lot of other creeks I’ve been in over the years. 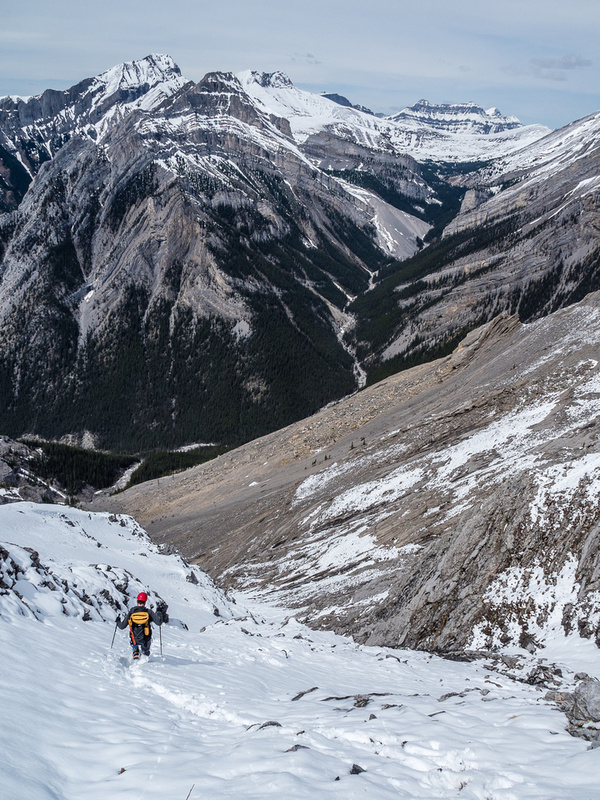 After a share on social media (from a friend I was supposed to join a week earlier), I knew that the peak would have more traffic than usual and we ended up passing a group on the approach to the access gully. 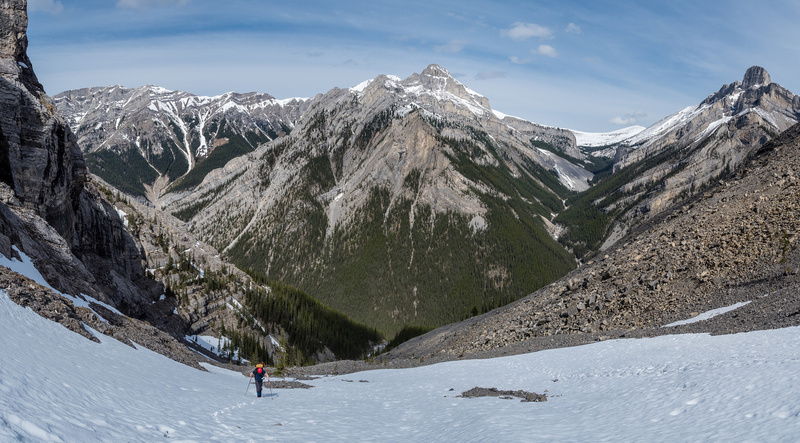 After a few hours in the creek, things started getting a bit monotonous and my least favorite part of the day was finally getting to the steep access gully leading to Cougar, realizing that we’d gained very few vertical meters to this point. 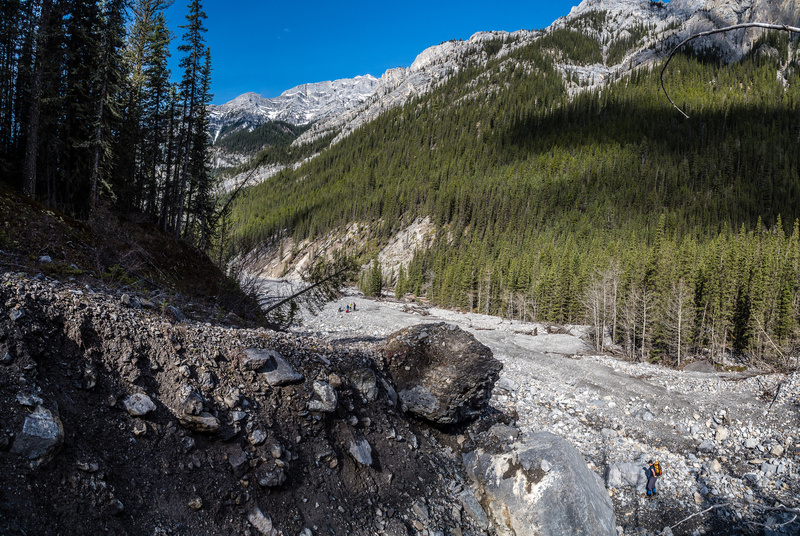 The day was gorgeous and the smell of Spring was in the air as we started up the initial, steep gully / streambed from Cougar Creek. 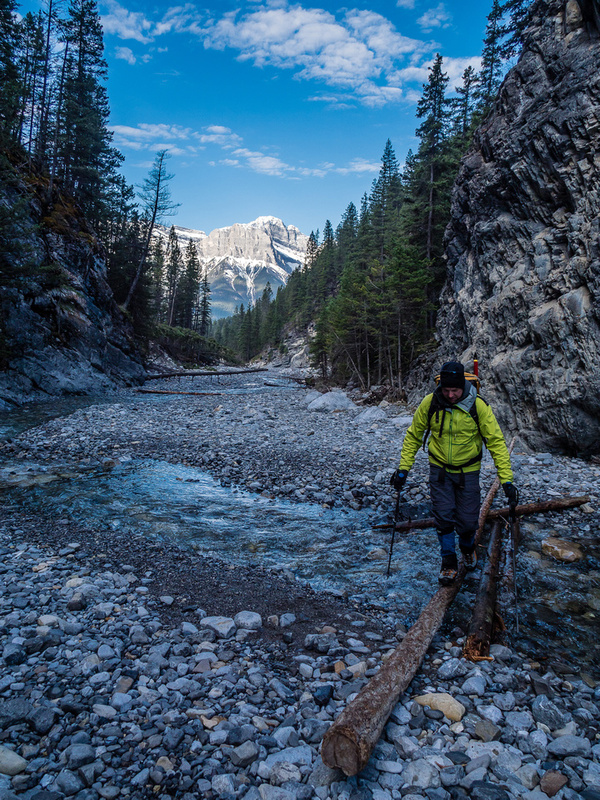 For the most part Cougar Creek is open and easy walking. Plenty of running water on route too! 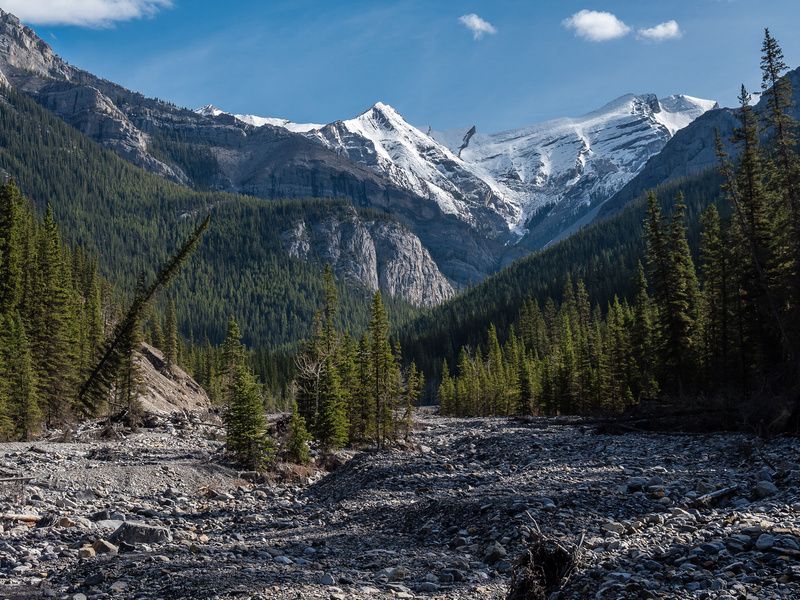 With the popularity of the peak increasing, there is now a nice trail forming in the scree on various parts of the mountain. 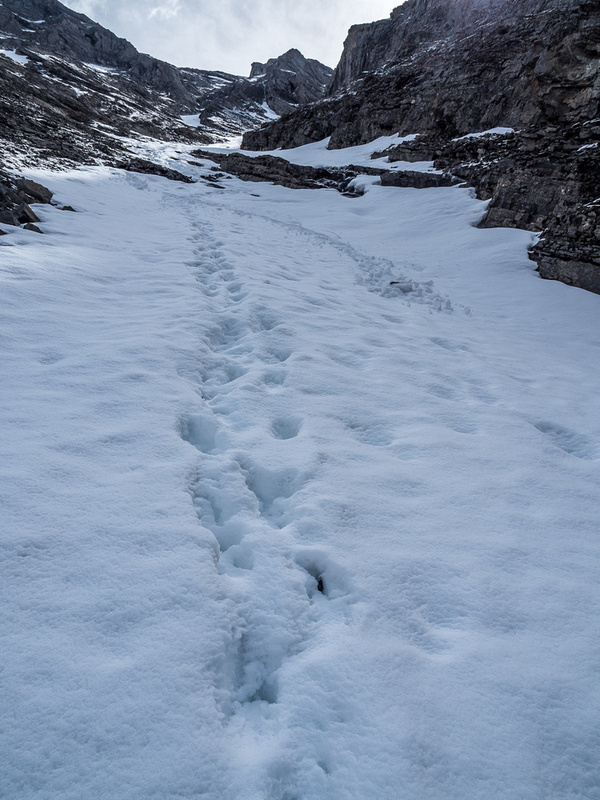 We followed this faint track up the steep initial section before the gully laid back for a bit. 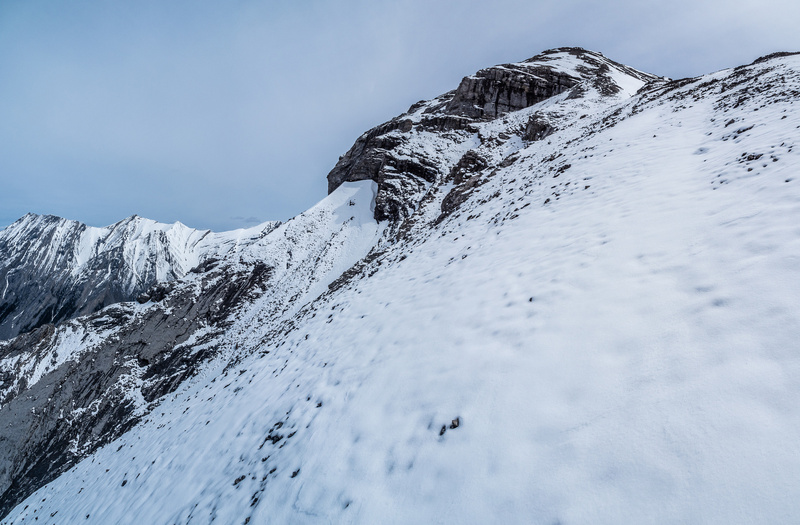 I was surprised at the amount of snow lingering on our route – much of it probably from a few nights previous when the Canmore area peaks got around 5-10cm. 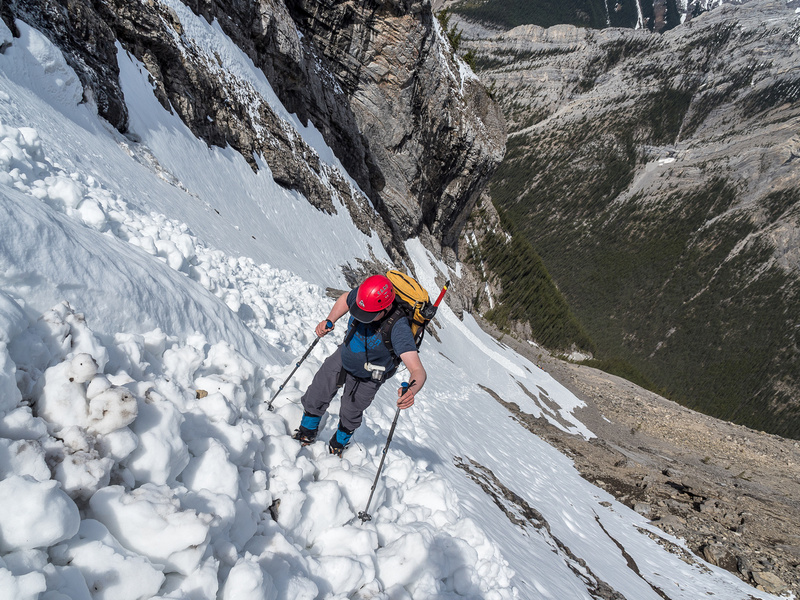 There was old snow in the gully already lower down and we took full advantage of how locked up it still was but kicking our way quickly up several hundred vertical meters before the lower snow patches transitioned to scree. The views were opening up nicely by the time we got to a steeper snow gully replete with fresh avy debris, leading up to the summit far above. 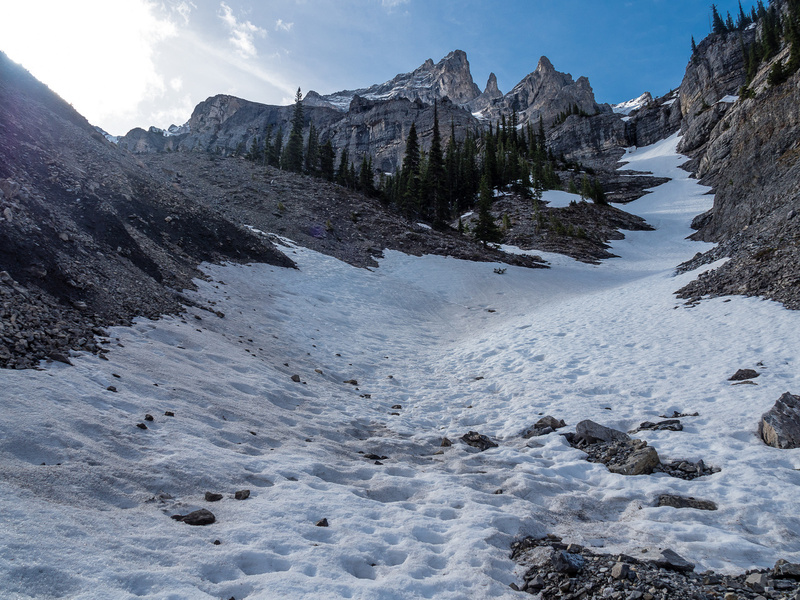 We took a break at this point, donning crampons and prepping for what looked like some fun snow scrambling. Ascending the steep lower section of the drainage on climber’s left. We could hear the group coming up behind us as we started up the firm(ish) snow, following tracks from previous groups that were mostly snowed in but still offered a more supportive option than straying off them. The crust was getting punchy as the angle steepened, making it more work to break trail. At an obvious pinch point in the gully, where it steepens considerably along rock slabs, the ascent became slightly more “alpine” than just “scrambling”, due to what Wietse and I both felt was a tricky slab sitting on several feet of a very unsupportive, bottomless snow that was ready to slide all the way back down the gully, given the right trigger and conditions. 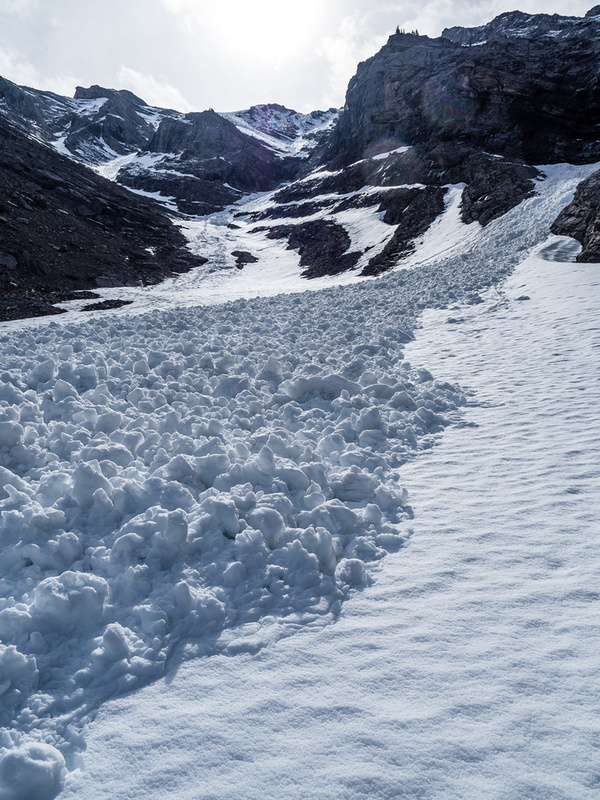 Several recent avalanches had already come down in the area over the past day or so, and we certainly didn’t linger at the choke point. We really didn’t want to set off the gully as we had another party far below us that would not fare well if that happened! Because of this short section, I’m not sure I can recommend scramblers use Cougar as an early season objective with snow. YMMV, but caution and an awareness for avalanche terrain is not a bad idea if attempting this peak in Spring conditions, IMHO. I’ve had terrain like this surprise me before, and not in a good way. 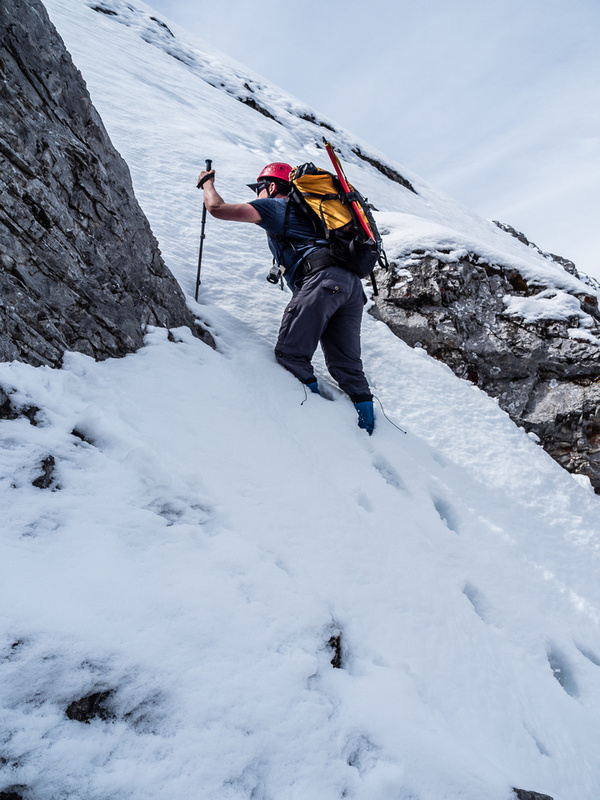 Wietse follows up the semi-firm snow in the mid-gully before the choke point. 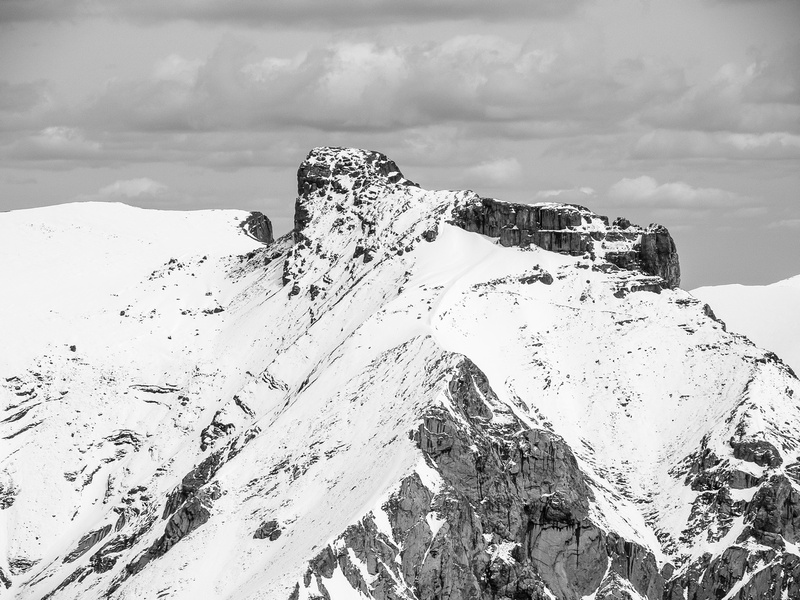 The terrain steepens significantly through the choke. You can see that the snow has no base anymore and is sitting on a mixture of slabs and ice. 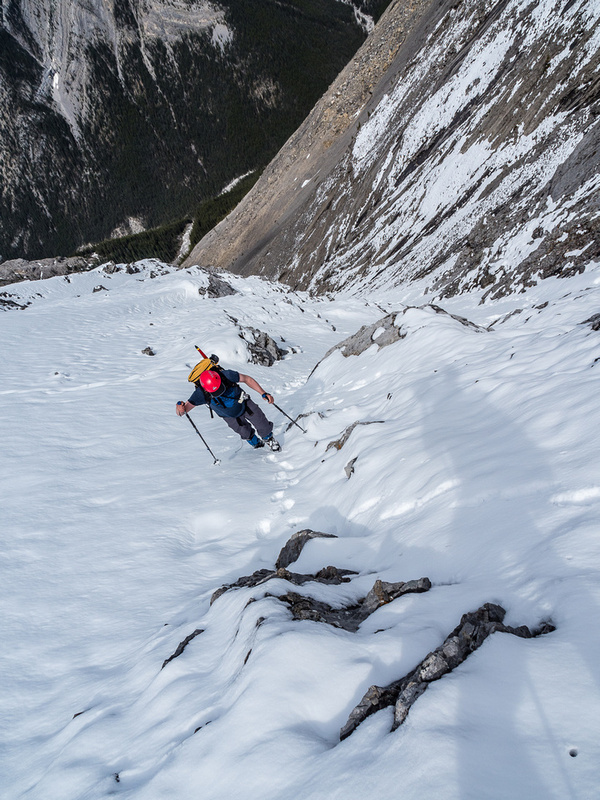 One last steep traverse to avoid some slabby terrain and get onto easier slopes to the summit ridge. Above the choke point things got easy and quick again on fresh snow and scree. 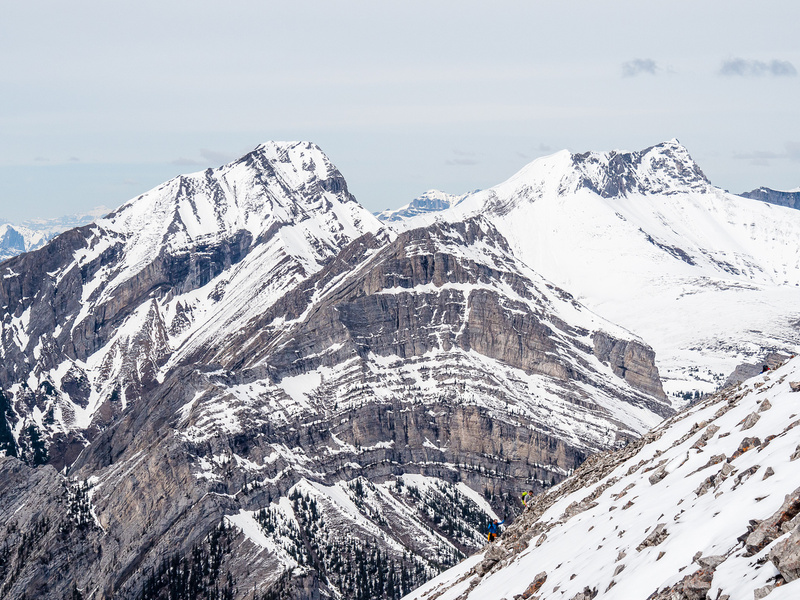 I was impressed with the views as we topped out at the col under the summit block and started up on a mixture of snow and scree. 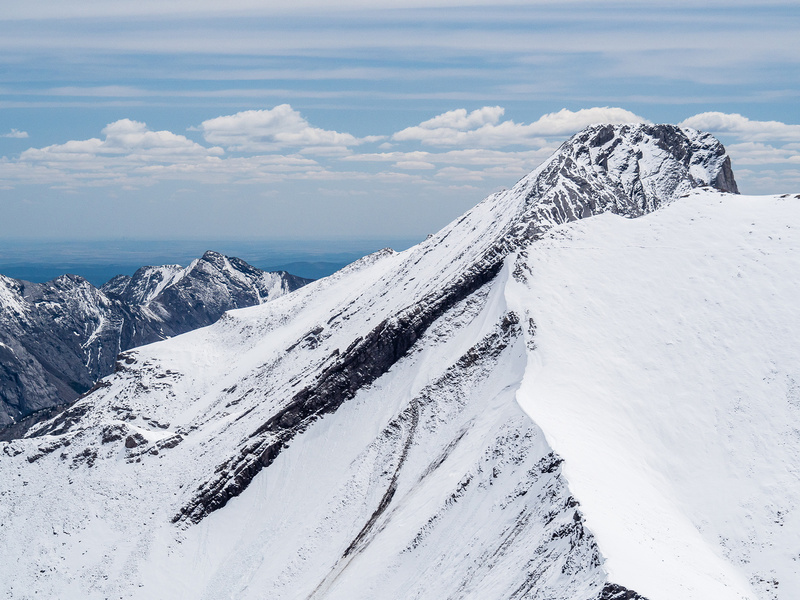 I led to the summit, keeping my crampons on most of the way until the final ridge traverse which was quickly drying out in the delightfully warm and windless conditions we were experiencing. Looking back as I go for the summit ridge. Wietse is starting up from the col and another gentleman is almost at the col behind us now. 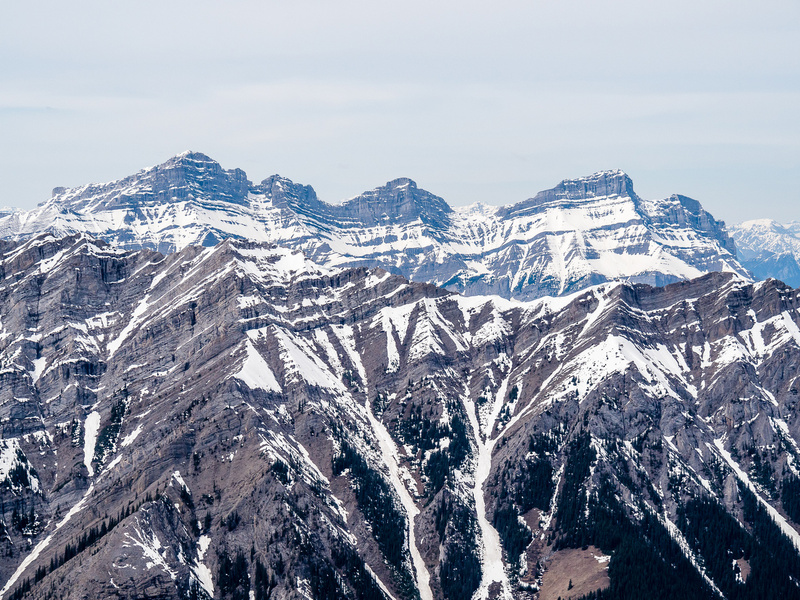 The summit views were awesome, including Assiniboine, Lougheed, Townsend and many other familiar and unfamiliar peaks. We spent some time rehydrating, eating and waiting for a few more parties to reach the summit before making our exit – we wanted to get down the crux snow gully before the day went really hot and before other groups would be descending down the snow slopes on top of us. 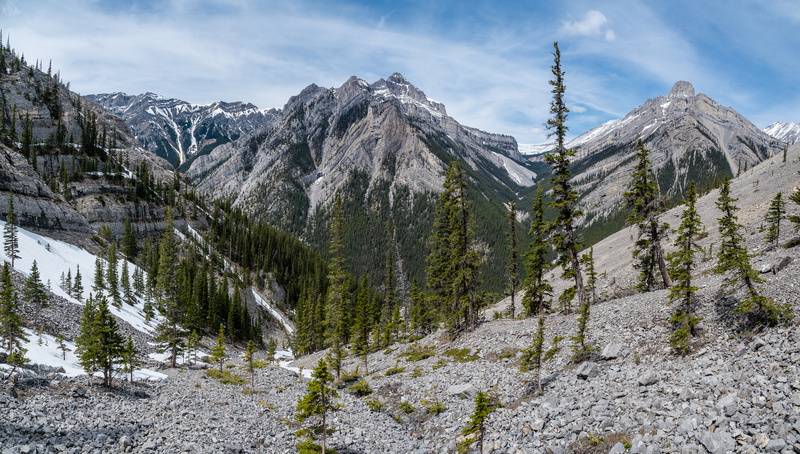 Looking east (L) and south (R) towards Mount Fable and Grotto Mountain. The other side of the summit ridge looking east (R) to north (L) including Mythic Tower, Epic Tower, Mount Townsend and Stenton Peak. Looking back along the summit ridge of Cougar Peak with Charles Stewart at center, Grotto at left and Townsend at right. As expected, the snow made for a quick and easy descent. The bottom was definitely falling out of the snowpack however, and we were glad to be off the snow sooner than later in the day. We took another nice break before continuing down the gully towards Cougar Creek, enjoying the chirping birds, the smell of vegetation and the gorgeous weather. 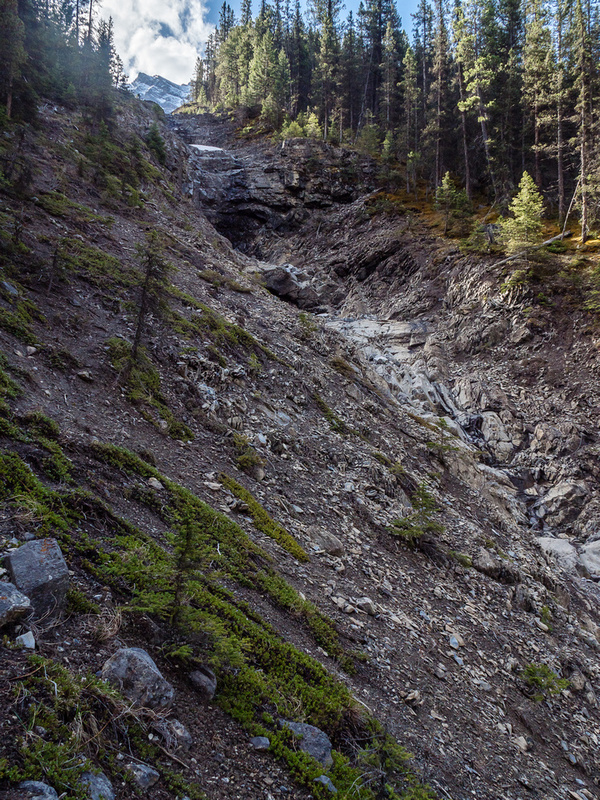 As expected, the slog back down Cougar Creek was long, but surprisingly felt shorter than on approach for some reason? Maybe it’s trying to entice me back to do Townsend soon. Dropping down to the access drainage above Cougar Creek. 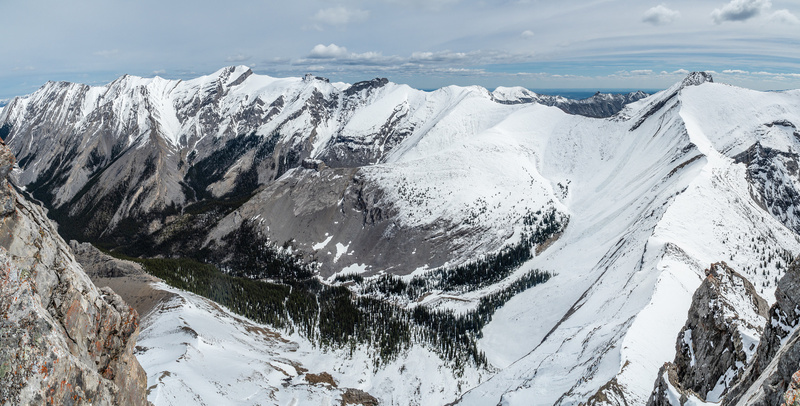 I recommend Cougar Peak for experienced parties if there’s a chance of snow on route (bring traction devices / crampons and axes) and for all parties in dry conditions when it’s no more than easy to moderate scrambling. 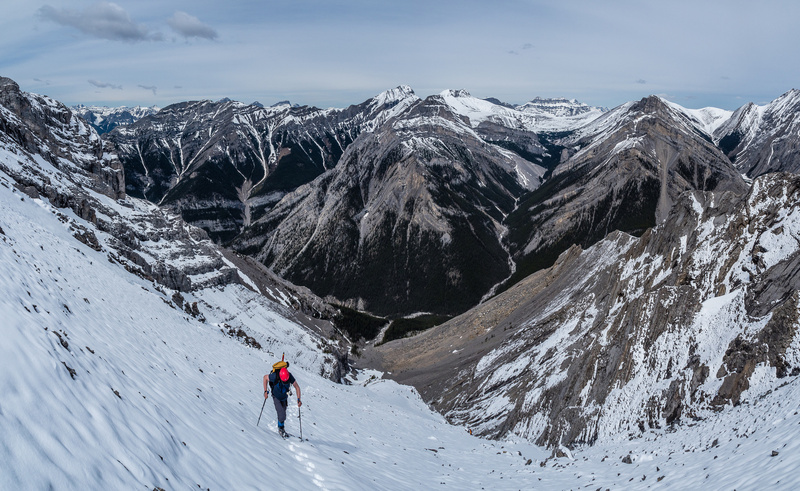 It’s not a huge day, but offers a more remote feel than more popular local Canmore peaks and has great views. Mount Townsend is a LONG way up Cougar Creek and looks to be plastered with fresh snow this morning. Starting up the steep access drainage to Cougar Peak. It doesn't look inviting from below but it quickly tames out. Ascending the steep lower section of the drainage on climber's left. Looking forward to quick travel on the snow patches. At this point we'll go up and then left on snow. The snow was rock hard in the morning. Looking back down the access drainage. Looking up old steps towards the steep terrain around the choke. It's much further than it appears at this point. A gorgeous day with views starting to open up behind us towards Charles Stewart. Looking up to the col and ascent slope to the summit ridge. Mount Townsend at right, Stenton at left. Mount Fable with Old Fort Peak in the background at left. 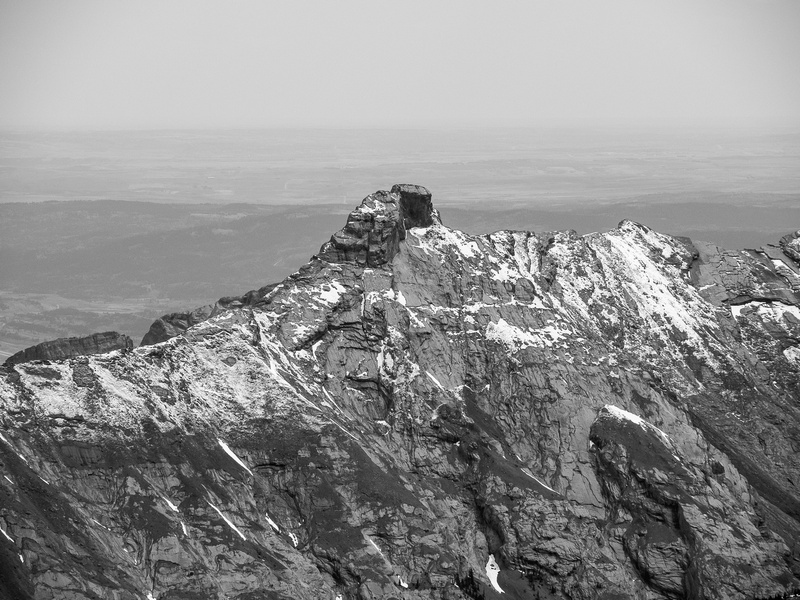 Old Fort Peak is an outlier of Morrowmount. 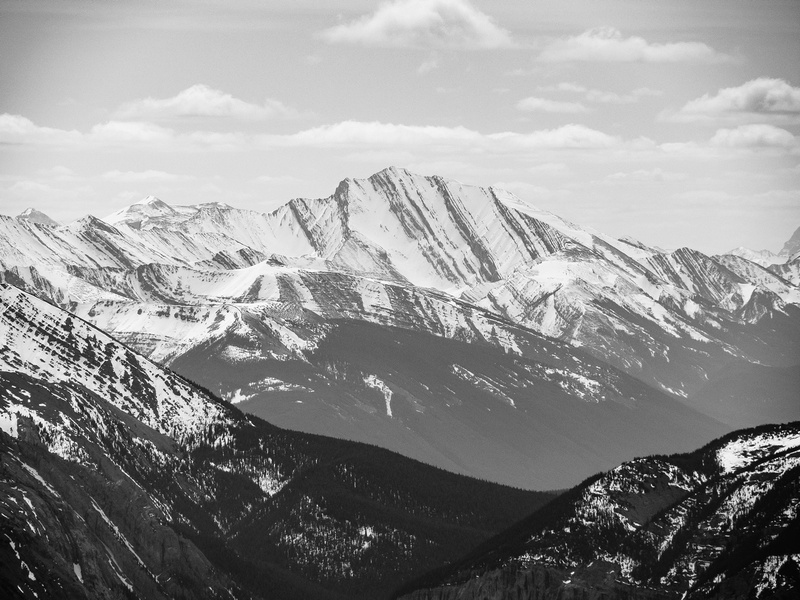 Bob Saunders, Reg Bonney and Rick Collier made the first ascent (5.4) in 1991. Morrowmount lies to the east. I scrambled that one back in 2007, also with Wietse. Epic Tower lies along the ridge from Townsend to Fable. Mount Townsend is a LONG bloody way up Cougar Creek! It has been getting more and more popular after many years of neglect. Mount Girouard at left with Mount Astley at distant right of center. 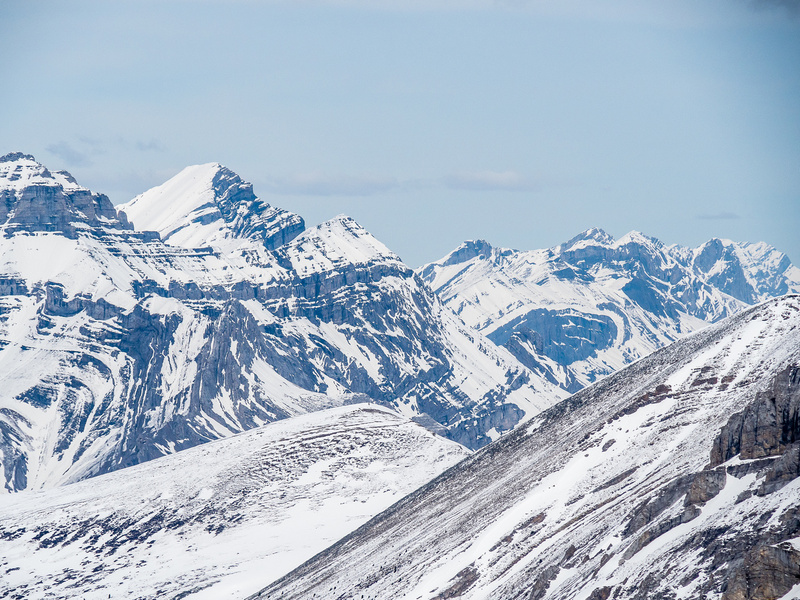 Note the scramblers coming up to the summit ridge in the foreground. 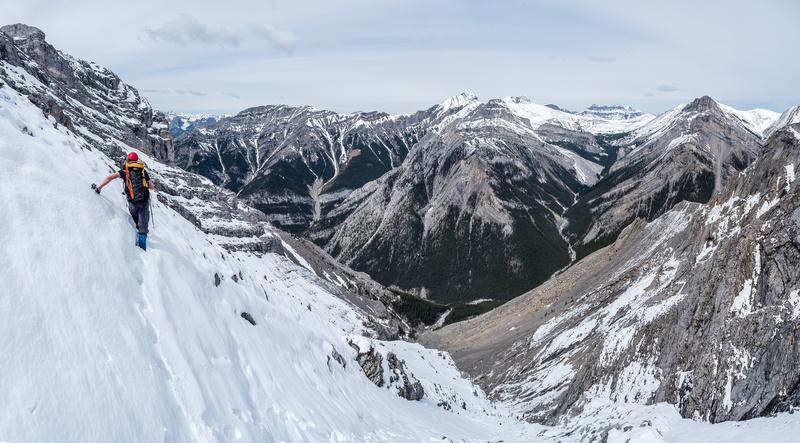 This is looking over an outlier of Charles Stewart towards Buffalo Point (Charles Stewart South) and the main summit at right. 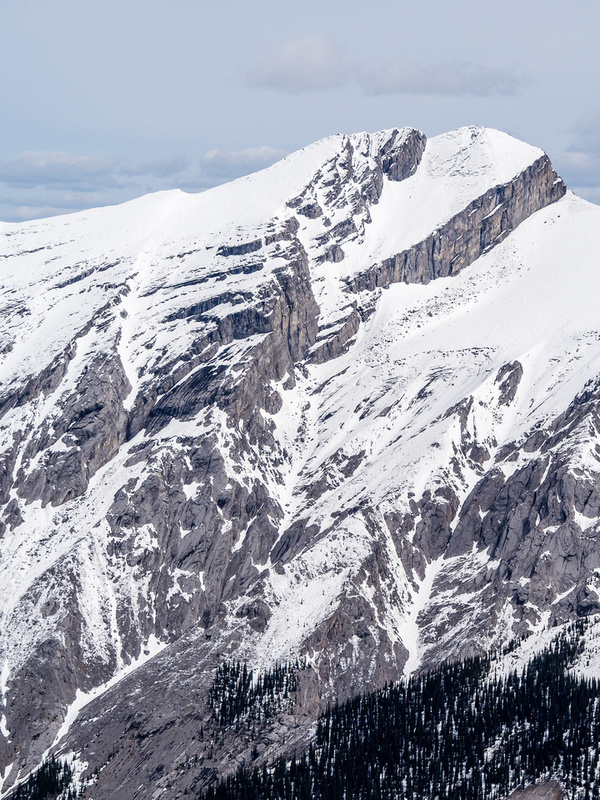 Mount Rundle looms over Lady Macdonald. 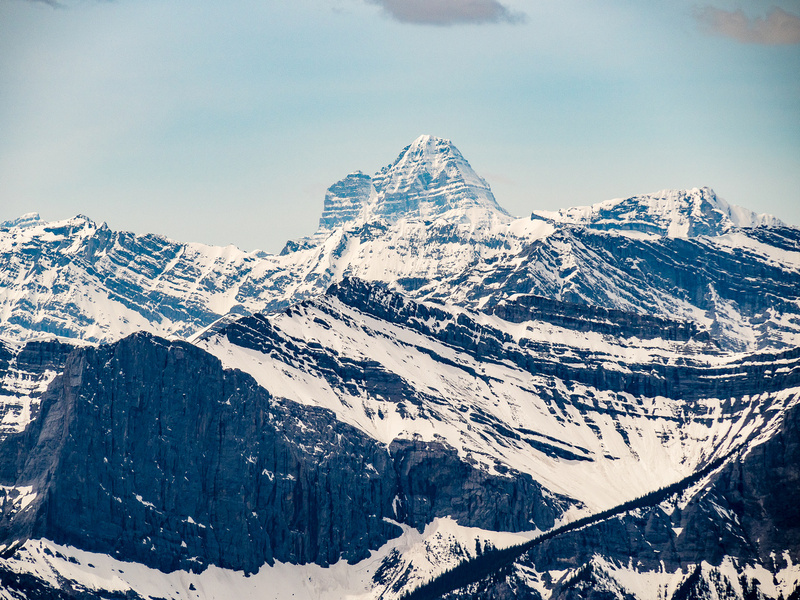 Mount Assiniboine looms over everything - as usual. Lunette at left. Fisher Peak is still a favorite scramble of mine. 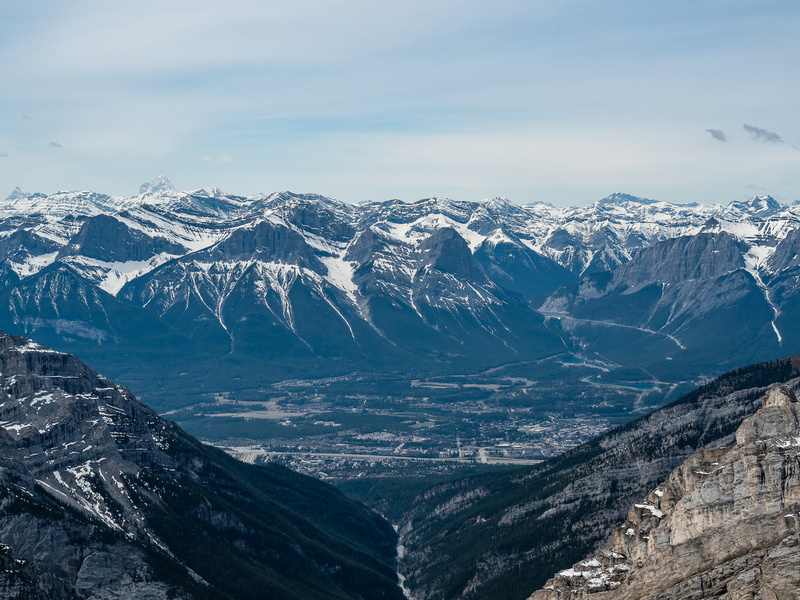 Looking over the mountain town of Canmore towards familiar and popular peaks such as EEOR, Ha Ling and Lawrence Grassi. 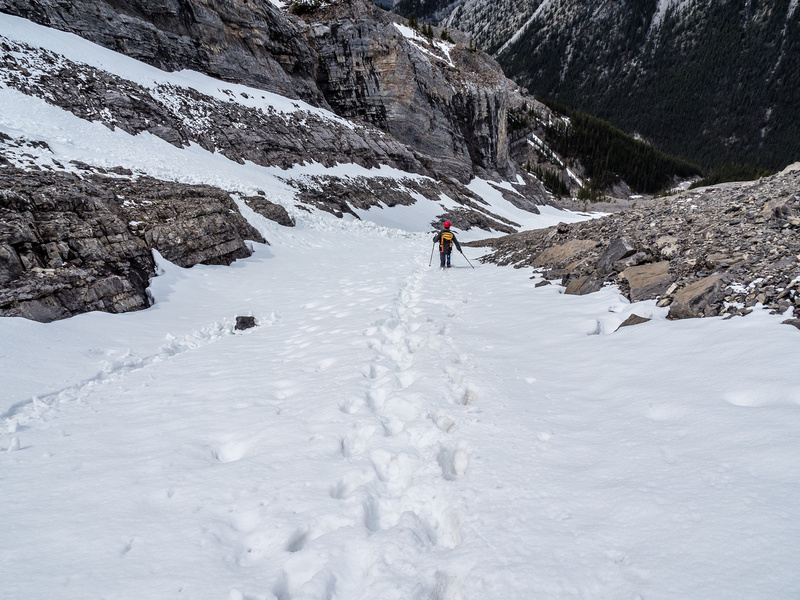 Trying to avoid the slick slab that's hiding under the fresh snow as we descend to the choke. A wee bit too soft to descend really quick - but better than slabs / scree. 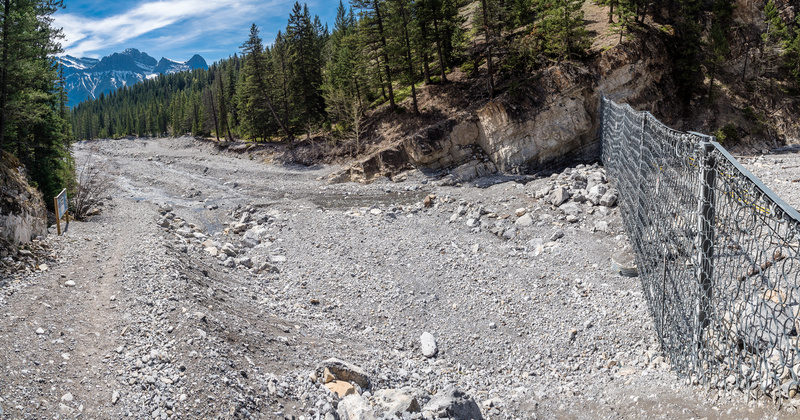 This specialized fence is meant to help delay catastrophic flood damage downstream in Canmore.